HOUSTON, TX -- (MARKET WIRE) -- May 4, 2007 -- ZEH Software, Inc., the worldwide leader in network printing solutions, montaging, and image publishing for geoscientists in the oil and gas, GIS, and MCAD industries, announces support for the new HP Designjet T1100 and Z6100 devices in PLOT EXPRESS, which provides a scalable and flexible software solution for all the large-format printers in your environment. "We've added new options to our software that enable our customers to leverage the 'Economode' on the HP Designjet T1100 and emulation of legacy devices for both the T1100 and Z6100 devices," said Carol Langland, Product Manager at ZEH Software. "With the 24-bit color output from PLOT EXPRESS, our customers should get outstanding results with these devices." "Our customers continue to benefit from the partnership ZEH has had with HP for the past decade," said Scott Reeder, Product Marketing Manager at ZEH Software. "HP continues to improve the value of its large-format printers, and ZEH's software helps companies realize that value." PLOT EXPRESS establishes a common solution for all technical printing, manages printing from a diverse environment of applications to many different printers, and offloads file processing from the workstation and printer to a print server. Users submit files to the system, and PLOT EXPRESS handles the complex tasks of routing, processing, and printing the files. -- Regain control of your busy printing environment. For more information about PLOT EXPRESS, go to http://plotexpress.zeh.com. Existing PLOT EXPRESS customers can contact their technical support representative to obtain information about adding T1100 and Z6100 support to their existing installations, or go to http://www.zeh.com/supportdl.php. ZEH Software, Inc., a privately held company with headquarters in Houston, Texas and additional offices in the United Kingdom, is the worldwide leader in network printing solutions, montaging, and image publishing for the oil, gas, GIS, and MCAD industries. With over 25 years of experience, 3,000 installations, and 100,000 users in more than 80 countries, ZEH's clientele includes petroleum and chemical companies, engineering firms, government agencies and aircraft and automobile manufacturers. 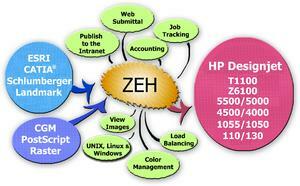 More information about ZEH Software, Inc. is available at http://www.zeh.com. PLOT EXPRESS is a registered trademark of ZEH Software, Inc. All other trademarks, service marks and logos, with or without attribution, are the properties of their respective owners. About this company ZEH Software, Inc.